New Britain — Mayor Erin Stewart’s late entrance into the crowded race for governor Monday challenges Connecticut Republicans to embrace a socially liberal millennial who has won three races in this racially diverse and overwhelmingly Democratic city, alternately impressing audiences as fresh, engaging and at times irreverent. If elected, Stewart would become the youngest U.S. governor since the election in 1938 of Harold E. Stassen in Minnesota. Stewart turns 31 on May 4, the same week Republicans are to endorse a statewide ticket at their state convention, where four or more candidates could qualify for the GOP primary in August. “It’s time for my generation to step up and truly lead the way,” Stewart told a midday audience at Central Connecticut State University, her alma mater and a major employer in a city once known for its manufacturing of hardware and other metal goods. Stewart began raising money with an exploratory campaign on Jan. 29, trailing as many as eight Republicans who either have raised or seem on track to raise the $250,000 in small donations necessary to qualify for public financing. Two other wealthy businessmen have opted out of the voluntary public-financing program. Stewart joined President Trump in the Oval Office recently at an event publicizing federal tax incentives available to employers in struggling communities, but she otherwise has distanced herself from the president, saying Republicans need a gubernatorial nominee capable of attracting cross-over votes to win in Connecticut, where only 21 percent of voters are Republicans. Erin Stewart announced her candidacy at CCSU’s Founders Hall. Hillary Clinton beat Trump in the state, 897,572 to 673,315. Her candidacy is the second event in event in four days that has unsettled the GOP race. On Thursday, Danbury Mayor Mark Boughton collapsed with a seizure at a campaign event. He is widely seen as the leader in the contest for convention delegates, though short of a majority. Boughton, who underwent surgery in August to remove a large cyst from his brain, blamed his seizure on dehydration and his apparent failure to take an evening dose of an anti-seizure medication. He resumed campaigning Monday. 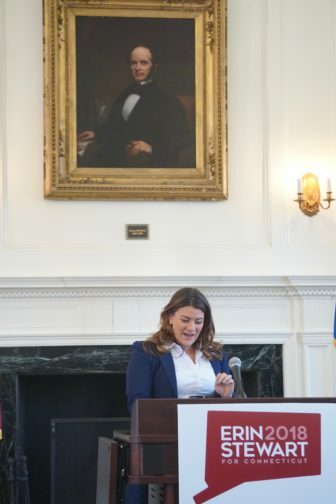 Stewart, who is helping to organize a Gay Pride event in New Britain this summer, describes herself as a fiscal conservative and social liberal, supportive of abortion rights and gay rights. She is a gun owner who says she is comfortable with reasonable controls. She declines to join Republicans who say they would try to reinstate the death penalty, repeal the post-Newtown gun controls or end collective bargaining for public employees. Before the open race for governor in 2010, Connecticut Republican candidates kept their distance from Wisconsin Gov. Scott Walker, the Republican who won passage of laws curtailing the bargaining rights of public-sector unions. Tom Foley, the eventual GOP nominee in 2010 and 2014, said Wisconsin offered no template for Connecticut. This year, most Republican candidates say they favor ending collective bargaining by state employees for pension and retiree health benefits. Stewart was dubious about seeing Walker’s experience as a template for Connecticut. 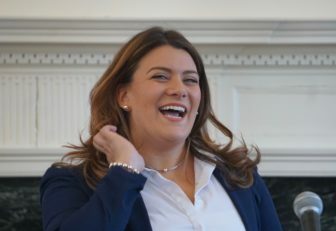 The next in a series of the Connecticut Republican Party’s monthly forums for gubernatorial candidates is April 4 at New Britain High School, but her participation is uncertain because the event is open only to declared Republican candidates who have raised at least $175,000, a threshold Stewart might not reach with just two months of fundraising. Romano’s predecessor, Jerry Labriola, who has signed on to Stewart’s campaign as a strategic adviser, said no other candidate in the GOP field is capable of drawing young new voters. Bill Clinton was 32 when he was elected governor of Arkansas. Stassen was 31, less than a month younger than Stewart would be, when elected in Minnesota. Connecticut elected John G. Rowland to Congress in as a 27-year-old in 1984 and as governor as a 37-year-old in 1994.